Non-league Southport reached round two of the FA Cup for the first time since 2002 by upsetting League Two Dagenham & Redbridge, while fellow Conference side Telford beat Basingstoke to progress. Jordan Chiedozie's equaliser earned Concord a draw in the rearranged match. 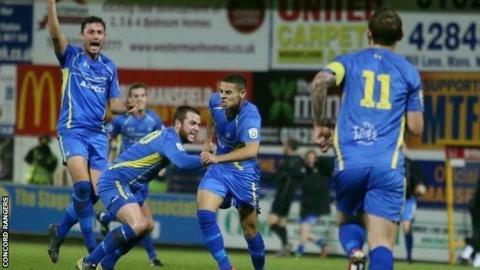 Telford reached round two for the first time since being reformed 10 years ago. Liam Watson's side - bottom of the Conference - could only name five substitutes due to a heavy injury list, but goals from Andrew Parry and Tony Gray proved enough in a 2-1 win. "We couldn't do anything about the injuries, we just had to go along and field the team we did," Watson told BBC Radio Shropshire. "We have to be sensible how we look after them in the next few weeks." The Bucks will travel to League One Bristol City in round two while Southport, who have gone 10 games unbeaten since Gary Brabin became manager, will host another Conference side, Eastleigh. The Sandgrounders never looked in danger in a 2-0 win as a Danny Hattersley penalty built on John Marsden's penalty-box finish after Dagenham's Luke Howell was dismissed. "Since we've got through the door the lads have been different class," Brabin told the club's website. "It's nice to have this record to build on and it gives the lads confidence to buy into what we are doing. "We are delighted with the performance. The crowd were brilliant, like the Southport I know having played here and managed here." It is the first time Southport have beaten a Football League side since their 2002 FA Cup win over Notts County, who were beaten 2-1 at Accrington Stanley. Stanley manager John Coleman praised "character, grit and determination" as his side fought back from a goal down to eliminate the League One side. Despite smoke bombs and a packed out Woodspring Stadium, Weston-super-Mare were beaten 4-1 by Doncaster - a full 75 places above them in the pyramid. Canvey Island-based Concord, who sit 15th in the Conference South, fell behind early on at Mansfield before Chiedozie, the son of former Tottenham and Nigeria winger John, smashed a stunning 30-yard effort to level. Sheffield United - the first third-tier team to reach the semi-finals in 13 years last season - beat Crewe 2-0 and "dominated" according to boss Nigel Clough. League Two sides AFC Wimbledon and Shrewsbury beat York and Walsall respectively, while Rochdale, of League One needed a stoppage-time winner to eliminate Northampton, who led until the 85th minute.